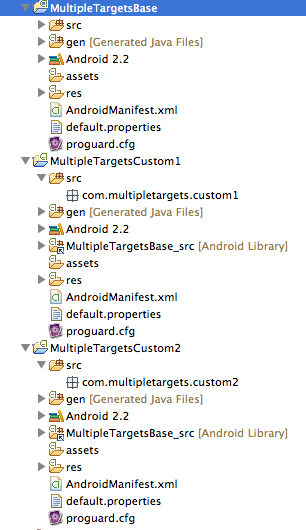 Some of you might have read my article Android: Deploying multiple targets from one project. It describes how to create customized versions of the same software and therefore benefit from multiple apps with the same featureset. That deployment with an Ant script has proven to work well. For example our GMX Mail App is available in four different customizations, for different brands, and uses a similar approach with maven. However, there is a better way now to handle multiple targets. It is less complex and gives you even more options to customize the different targets. By using an Android Library Project, you still have the benefit of sharing resources and code, without the hacky Ant script. Remember, the Ant script would go through every Java source file and change an import statement, just to resolve the different package name of the R File. Switching between Targets required an Ant build with a refresh of the workspace. Not any more. Now switching between projects is as simple as clicking the run button in Eclipse. Especially for bigger projects this is a huge benefit, because refreshing the workspace can take quite some time. That’s it. You can now overwrite all your base resources and source files in the custom projects. Every new feature developed in the base project is immediately available everywhere. Only if there is a need for updating the AndroidManifest, you have to edit it in all custom projects. But this also means you have a fine grained control over the manifest file. I updated my old example project on Google Code. Feel free to use it as a start for your own project with multiple targets. Feedback and contributions are always welcome. Do we have to modify the manifest files of the other projects to match the library project’s? Thanks. Great post. But using this method gives errors if the base project contains attrs.xml. Please see http://stackoverflow.com/questions/3432649/r-java-file-from-android-library-project-not-importing-into-application-project. Unfortunately, I haven’t found a good way of preventing duplication of the AndroidManifest.xml. You might use a template and insert the package name at build time. But then it is not easily possible to launch from eclipse. I used your previous method/script – this works better with SVN 🙂 I have an issue though…. debugging seems to fail. Eclipse can’t find class definitions and dosen’t stop at breakpoints!!?! Have you had the same errors or idea what I missed? Oh by the way, is the base project needed to be library-only meaning do I need two ‘custom’ projects for application A and B? Or can the base project serve as application A? An important detail I miss in this tutorial: any JAR file referenced by the base project must be also added to the children’s buildpath. For example, I kept getting a NoDefClassFoundError for a fragmentActivity which didn’t dissappear until I added supportPackagev4.jar to my rebranded project’s build path.